A new slot game from Williams Interactive has been released at several online casinos called Desert Cats. Some players might even know this game from land-based casinos. Desert Cats uses 50 lines on 7 reels which are 4 symbols high. During normal spins 2 adjacent reels are always wild, being covered by giant cat symbols. All symbols may appear stacked on all reels. A cat symbol is 4 by 4 and two appear during any spin. Each cat has 5 gem symbols which are normally blue. When you get 6 or more red ones you are awarded one of the 5 jackpots. 6, 7, 8, 9 or 10 red gems will award 10, 40, 80, 600 and 2000 times your bet. 3, 4 or 5 lion symbols will award 5, 15 or 50 free spins respectively. During free spins 2 sets of 2 adjacent reels will be covered with wild symbols, so 4 reels in total. For a much higher chance on winning. The jackpot feature is not active during free spins. 3 lion symbols during free spins will award 5 more free spins. More than 3 lion symbols during free spins is obviously not possible. Desert Cats is a really cool game and is also unique, I haven’t seen a slot game like this yet. 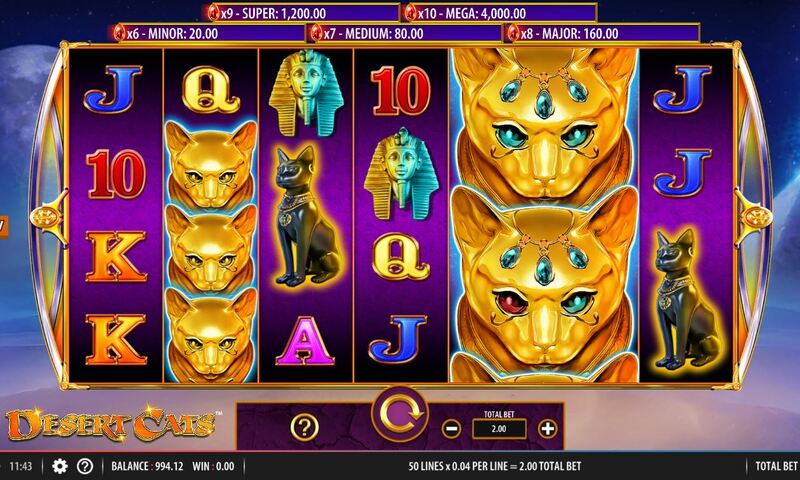 You are able to play Desert Cats at Casumo and Videoslots, among other casinos. Check out this game for yourself now and be sure to watch the YouTube video below for an impression of Desert Cats slot game.